Best Facial Oils for All Skin Types in India: Our Top Picks! 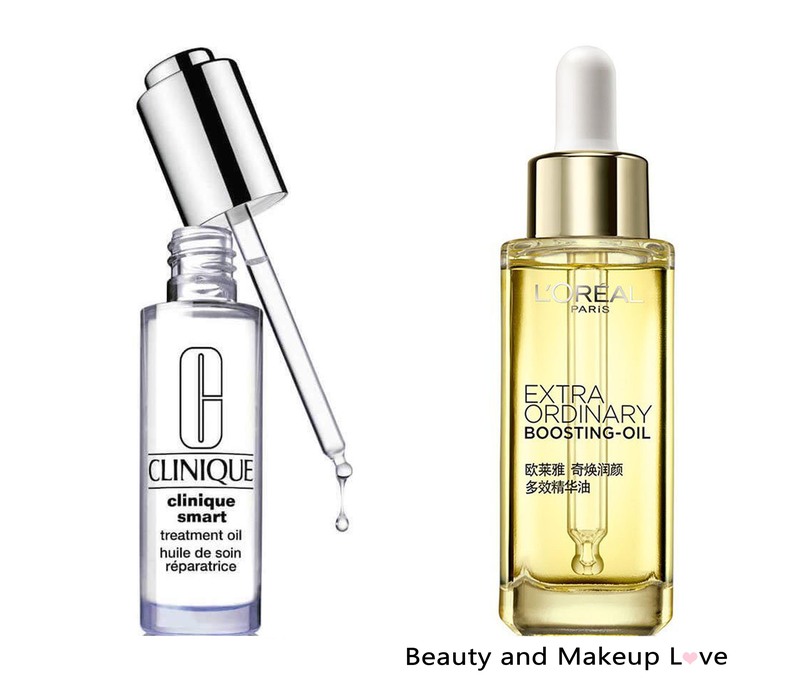 Facial oil is the new addition to the skin care regime. You can use them as moisturizer, night treatment, particular skin treatment or even as a primer so that your makeup glides flawlessly on the skin. There are various benefits of facial oils on our skin and it will improve your skin tenfold. 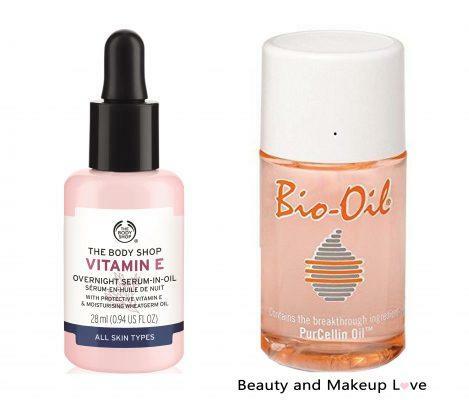 First and foremost, facial oil hydrate the skin thoroughly and prevent the formation of dry skin. Thereby, the wrinkles and other visible signs of ageing are reduced. A lot of us in our 20s faces pigmentation and acne scars which takes forever to fade but with regular use of facial oils, it helps to reduce the pigmentation a lot lighter. If you are wondering that ‘oil’ on skin may break you out horribly, no it’s not. In fact, oily skin can benefit a lot from the goodness of facial oils which are loaded with various ingredients to make the skin look healthier, brighter and naturally beautiful. Believe it or not, facial oil as a moisturizer will help the skin to control the production of excess sebum which actually causes acne. All you have to choose is the right facial oil for your skin and see how beautifully it transforms your skin in a month’s time. 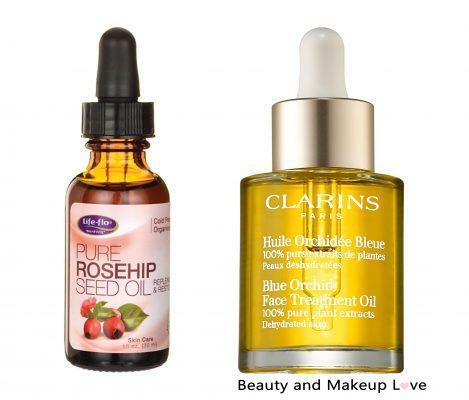 We have compiled a list of the best facial oils and surely it would help you to choose the finest one. 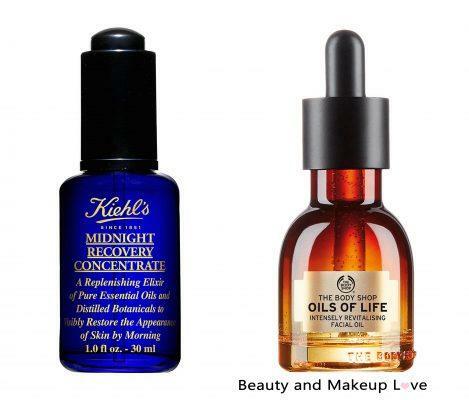 Kiehl’s Midnight Recovery Concentrate is undoubtedly one of the finest facial oils available in India. The price tag is exorbitant but the little bottle will last you for months and thus we would say it is surely a great investment of skin care. It comes in a bluish tint bottle with a dropper. The product is to be dispensed with the help of the dropper which has a consistency of a transparent oil and gets absorbed within few seconds on to the skin. It has an invigorating aroma of lavender and is suitable for every skin type. It is an overnight elixir which intentions to refresh, replenish and rejuvenate the skin making it naturally beautiful. This brand has always delivered the best of skin care for every skin type and investing in something huge is surely worth it when it is TBS. The Oils of Life comes in a ombre bottle packaging with a consistency of a very light weight oil. The earthy fragrance is surely something to love, this facial oil works like a charm for all skin types. In winter you simply have to use few drops extra and for the rest of the year, it gets absorbed in a jiff. It is formulated with the goodness of – Black Cumin seed oil from Egypt, Camellia seed oil from China and Rosehip seed oil from Chile that helps the skin to prevent the production of excess sebum and thereby controlling oiliness. It can also be used as a serum to hydrate the skin generously. 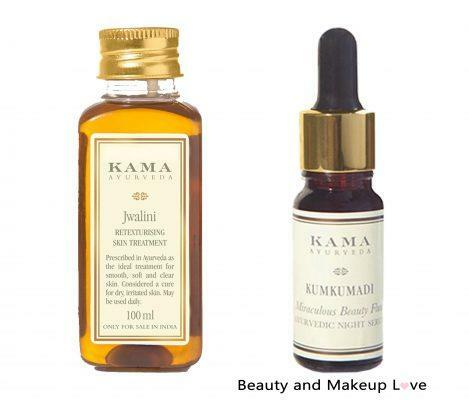 Kama Ayurveda is an Ayurvedic skin care brand whose Kumkumadi Tailam is the best elixir for the skin. It comes in a rather small bottle with a dropper. It has the consistency of a thick oil but as soon as you massage it on the skin, it gets absorbed and won’t irritate or break out at all. It gives an amazing glow to the skin especially when used religiously for day and night and works best for oily skin, as a matter of fact. It is surely pricey but investing in such a gem won’t hurt at all as it’s worth every penny. Another amazing facial oil from the house of Kama Ayurveda and surprisingly with a reasonable price tag is the Kama Jwalini Retexturising Skin Treatment Oil. It suits all skin types including oily skin. You can use it for both face and body to moisturize the skin from deep within. It heals the skin and aims for the remedial treatment of mild skin irritations and works to nourish, revive and rejuvenate the skin. With regular usage, it makes the skin smooth and prevents the appearance of wrinkles and pigmentation. In fact, the dull skin due to sun exposure can be treated with this magical oil. The only con of this oil is that it takes time to show results. Perhaps, something we all can wait for as long as it shows results! 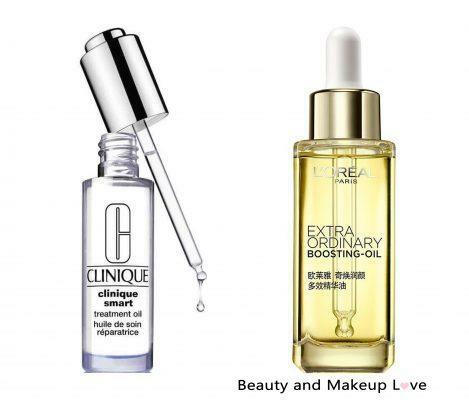 The Clinique Smart Treatment Oil targets to remove pigmentation and other blemishes with the triple antioxidant blend that nurtures the skin’s capacity for repair. The oil is extremely light weight and gets absorbed into the skin within seconds which is why it is suitable for every skin type though dry skin might need few extra drops for deep nourishment. If you use it twice a day regularly, you’d definitely notice the difference in your skin’s texture and skin problems. Even though it is a bit expensive, the oil will last you quite some time (for around 3 months), so it’s worth an investment. The wonderful luxe facial elixir form the house of L’Oréal. Compared to other facial oils, this one is surely budget friendly and has the goodness of a refined blend of 3 extraordinary oils – Desert Nut Oil, Geranum Essential Oil and Rosa Canina Fruit Oil. You require very few drops and it will moisturize, nourish and plump up the skin like no other product. It adds a natural glow and makes the skin as soft as a baby’s skin. With time and stress our skin tends to be become dull and tired but using this oil even once a day will revive the skin from deep within. This product is an absolute stunner and a winner for us! This is the Holy Grail facial oil of all dry skinned beauties out there. It comes in an opaque dropper shaped bottle and has the consistency of a normal light weight oil. It is colorless and smells of fresh roses. The moment you apply it – it will hydrate the skin generously, leaving the surface of the skin soothed, silky-smooth and hydrated without making it look oily/greasy. This facial oil works well as an anti-aging elixir and helps in easing out fine lines. Once you start using this, you can never go back to any other moisturizer, we SWEAR! This is one of the best budget friendly option in facial oils for every skin type. The best part of Bio Oil is that you can use it for body as well as face. There are numerous reviews on this product which certifies that it is the best stretch marks’ removing oil that actually works on stretch marks. It has a light weight and easy texture to work with. The oil will not clog pores and is safe for the skin and helps in the removal of mild tan and mild marks on the skin. The skin looks super smooth and adds a glow in the morning. With continuous use, Bio Oil helps in lightening the blemishes, dark spots, age spots and mild pigmentation and we recommend trying this product if you’ve got any skin concern to treat and are in search of a multipurpose product as it can be used as a moisturizer, primer, body oil, facial oil as well as a spot treatment. This oil is a dream come true for dry skin. This facial oil is made from 100% plants extracts so we are sure you are gonna fall in love with it! You can use it as a moisturizer, night cream and also as a primer to make your makeup go smoother. The lavender scent gives a soothing and calming effect to the skin and it feels extremely supple. With regular usage you will see how amazing the skin looks and how beautifully it brightens up the complexion. The only con is that the bottle is made of glass and might break if not taken care of. Rosehip oil is naturally abundant in retinoic acid, vitamin C and various other ingredients which have the power to transform your skin into an amazing charm. The Life-Flo Rosehip Oil comes in a dropper shaped bottle which has the consistency of a normal oil with a slight yellow tinge of color. This oil with regular use, helps reduce redness, pigmentation, makes the skin smooth, shrinks down the pores and adds a natural radiance and glow which will make you fall in love with your skin. It has a light texture and is best suited for oily to combination skin. Price wise it isn’t as high as some of the ones in the list and thus it is surely one of the best choices. 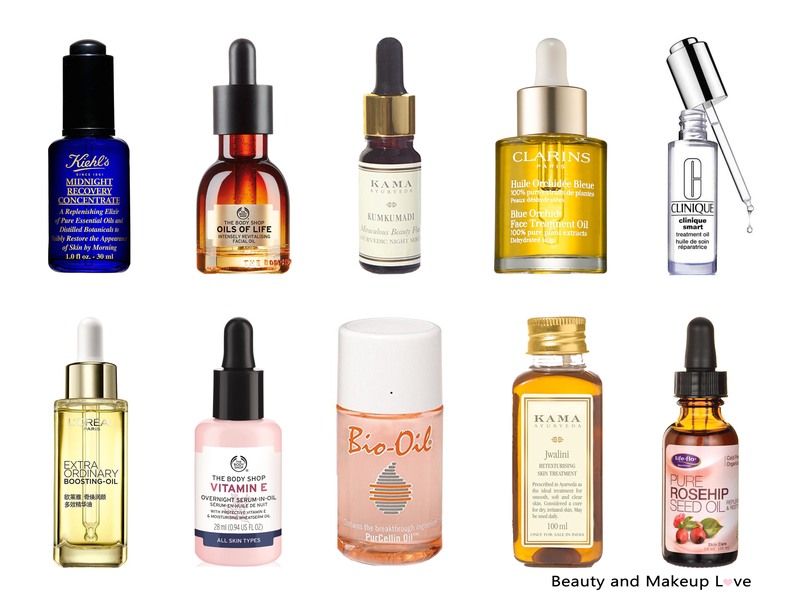 These are our top 10 picks for the Best Facial Oils in India, there are lots of facial oils in the market but we’ve handpicked the best of all for you to make a wise choice! Previous Previous post: Best Drugstore Foundations for Dry Skin in India! Next Next post: Best Charcoal Products in India: Detoxify Your Skin with Activated Charcoal!